Dr Sally Austen, the clinical psychologist who consulted on the programme, describes her involvement. Being a 'consultant' to a TV or film company is, in my experience, random. Poor experiences are mostly benign, for example, having one's brains picked for no recompense so that the company can say it consulted with a clinical psychologist and the promise further work going nowhere. Rare but more sinister is being paid to provide an opinion that is deliberately flouted for the purposes of gratuitous viewing: a lifestyle 'swap' program deliberately putting a contestant in a phobic situation that I had specifically advised against. However, my experience working with the documentary film makers RAW TV Ltd was a pleasure. 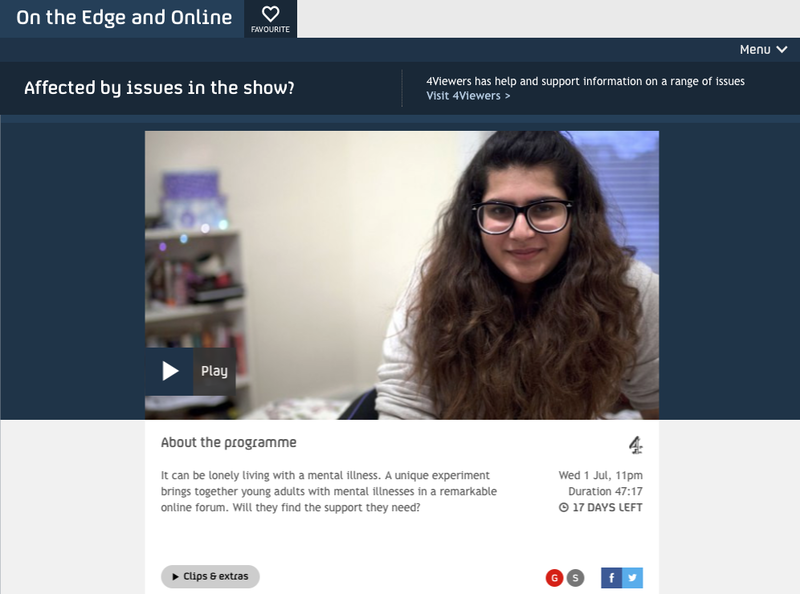 On the Edge and Online followed 18-25 year olds with severe and enduring mental illness trying online peer support. It is a beautiful piece with articulate, honest contributors and powerful, artist photography. My involvement was to devise safety protocols, provide mental health training to the interviewers and to scrutinise the video footage. Such a thorough remit meant that all concerned felt safe to delve deeper and listen longer. This is touchingly and painfully displayed in the detail of the 'voices' each of the young people describe. I think it is a blessing to continue to be surprised by our work. With legal secrecy I was invited to see the first complete edit of the programme in the barrista-powered world of Shoreditch. They had a suited driver (not just a taxi!) pick me up from Euston with my name on a board and I was offered a bridge into an alien world. My contribution to the documentary was clinical and could have been translated to many other situations. But what I felt they handed me back was art and was completely unique - and I shed a tear. So they brought me more coffee!